As is the case with most disasters, monetary aid is most needed and most helpful. Please encourage your communities to contribute to the relief organization of their choice. Nechama is accepting volunteers via its website, www.nechama.org. Repair the World has compiled a list of organizations with volunteer opportunities: http://werepair.org/blog/hurricane-sandy-how-to-help-now/16170?utm_source=Repair+the+World&utm_campaign=3fe30929b1-Hurricane_Sandy_How_You_Can_Help_Now10_31_2012&utm_medium=email. Security Community Network (SCN)/Jewish Federations of North America Due to continued power outages and road closures, damage in New York and New Jersey is still being assessed. JFNA has been in touch with Federations from Virginia to Maine. A few Federations remain without power and email. A strong coastal nor’easter has hit the already hard-hit region today and tomorrow. Precautionary measures, including evacuations, have been taken. On Monday the disaster declaration for New Jersey was amended to include all 21 New Jersey counties for Public Assistance and Individual Assistance. Just over 4100 people remain in 64 shelters in New Jersey, with shelters in Atlantic County and Ocean County filled to capacity. As of 7:00am this morning, more than 370,000 New Jersey customers in 17 counties were still without power, the most in Union County, followed closely by Essex, Monmouth, Morris, Bergen and Middlesex counties. Gasoline is still being rationed in 12 counties in New Jersey: Bergen, Essex, Hudson, Hunterdon, Middlesex, Morris, Monmouth, Passaic, Somerset, Sussex, Union and Warren. Six water systems in New Jersey are still subject to varying degrees of boil advisories: Long Beach Township, Ship Bottom, Stafford Township MUA, Fountainhead Parks, Reflection Lakes Apartments (West Milford Township), and those served by the Middlesex County Water Utility. All NY Waterway ferry routes between New York and New Jersey are open, with the exception of the Hoboken Ferry. PATH train service between New York and New Jersey continues to operate on a limited basis. New Jersey Transit is operating, although the North Jersey Coast Line is still suspected, and other lines are operating on a modified schedule. 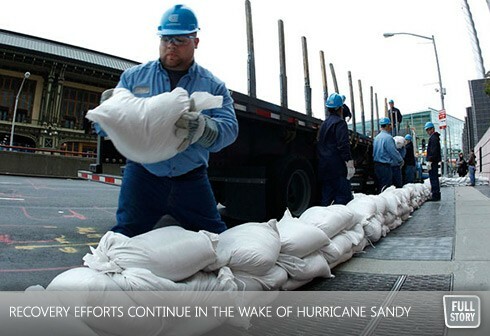 FINANCIAL ASSISTANCE UJA-Federation of New York UJA-Federation of New York has pledged up to $10 million from funds it has collected and its own endowment for relief efforts for New York area agencies, synagogues and individuals in a “Connect to Recovery” program. In addition it is coordinating dozens of volunteer opportunities including distributing supplies to frail seniors in Coney Island, collecting for food pantries on Staten Island, and checking on seniors on Long Island. Jewish Federations of North America (JFNA) JFNA and 22 Federations have opened mailboxes to collect monetary donations for disaster response. On Monday the JFNA Emergency Committee authorized distribution of $500,000, with $250,000 sent to UJA-Federation of New York to support the “Connect to Recover” program described above and $250,000 allocated to the 10 New Jersey Federations. Checks were issued immediately so that Federations could provide immediate humanitarian relief, including food, shelter, clothing and cash disbursements. Holocaust Survivors The Claims Conference is making a special fund of $250,000 available for relief work with Holocaust survivors being served by AJFCA agencies and others in the tri-state area. Association of Jewish Family and Children’s Agencies (AJFCA) All of AJFCA’s agencies are believed to have power, phone and email service, although internet access has been spotty. New York’s Jewish Child Care Association is still unable to return to its office in lower Manhattan, so staff are working from other offices around the city. AJFCA staff is working, despite having suffered personal losses and being displaced from offices. Local agencies are supplying clients and their broader communities with food, clothing and other necessities, but the long range effects of the storm will need to be addressed. Chabad: Chabad has opened an emergency office in Brooklyn. Donations totaling $100,000 had been received as of Monday, and over $80,000 distributed. Kosher MRE’s are being delivered. Thirty Chabad institutions have been damanged. JCC Association JCCs are assisting JCC staff affected by the storm and are raising money through a staff campaign. The Shorefront Jewish Community Council in Brighton Beach is operational, but the Kaplan JCC on the Palisades (New Jersey) and the JCC of Kings Bay in Brooklyn have been destroyed. In addition, JCCs in several locations, including two in Connecticut are serving as shelters for the general population. See an update here. JCRC of New York Most New York Jewish agencies are back to work, with the exception of some in the Wall Street area that remain without power. The Metropolitan Council on Jewish Poverty and New York Legal Assistance Group remain closed and are operating out of UJA-Federation offices. Some JCC’s also remain without power. Greater Miami Jewish Federation A mailbox has been opened and $15,000 raised (as of Monday) for short-term assistance. Jewish Council for Public Affairs (JCPA) The JCPA has had its power restored and is working directly with JFNA to coordinate JVOAD’s communications efforts. Jewish Federation of Northern New Jersey Offices are now open, and the Federation is following up with its agencies. Federation is also in touch with Bergen County VOAD. Jewish Family Service in hard-hit Bergen County is operational. JFS is still assessing needs; immediate humanitarian assistance is required. The Jewish Community Relations Council (JCRC) is coordinating resources, including delivery of items originally to be collected on Mitzvah Day to the places they are needed most. Nechama Nechama is on the ground in New Jersey, providing volunteers at multiple sites in Hoboken removing damaged furniture and equipment and cleaning up. Volunteers are also being dispatched to Long Island. Religious Movements The Union for Reform Judaism (URJ) reports that two synagogues were damaged. A relief fund had received 500 donations as of last weekend. The Orthodox Union is maintaining updated information on the status of all of its synagogues. COMMUNITY REPORTS Ocean County Danny Goldberg, executive director of the Ocean County Jewish Federation, reported that this past Shabbat, a Bar Mitzvah was scheduled at a Conservative synagogue on Long Beach Island, which was devastated by the storm. They were able to move the Bar Mitzvah to a hotel inland. The hotel owner donated the space and food. Other congregations provided tallitim, siddurim and other necessities. Thanks to this community effort, the Bar Mitzvah boy, a cancer survivor, was able to celebrate his simcha with his family and friends. New York City UJA-Federation of New York reports that network agencies, synagogues, donors and volunteers are working together in a coordinated response to the storm. Two hundred deaf community members in need of apartments have been relocated to another agency’s apartments. A Manhattan synagogue has provided volunteers to a synagogue in Queens that suffered terrible damage. Within hours of hearing of a student whose family lost everything and who lost textbooks and a computer she had worked all summer to pay for, Brooklyn College Hillel students set up a fund to help her replace them.